I have to admit, I have always thought that scrapbooking is not for me. I have visions of glitter paint and glue sticks and gaudy paper with cutesy embellishments. Don’t get me wrong. I love beautiful things, and the scrapbooking aisle has plenty of gorgeous papers and beautiful embellishments too. But I never considered trying any kind of scrapbooking until I discovered Project Life. And let me say, I love this project. Before I even decided to do the seasonal spreads to get my Project Life album started, I knew I wanted to do a spread documenting my garden from beginning to at its height, when I’m harvesting from it and canning and making things. 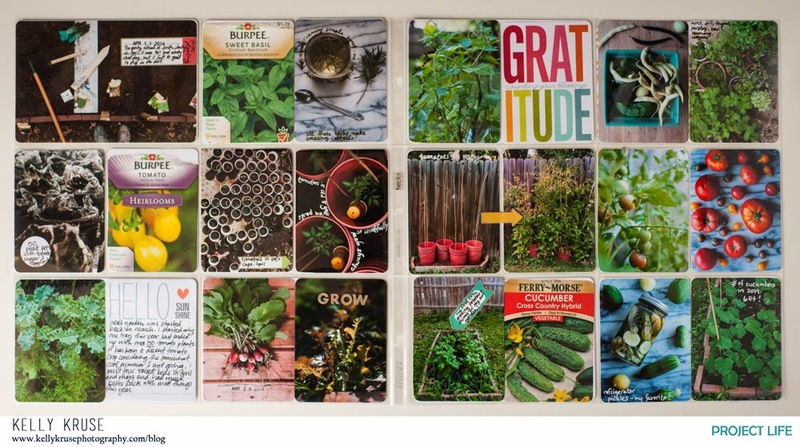 I love how the second row across both spreads tells the story of my tomato plants from seed to fruit. Gardening is one of my greatest joys each year, and I’m excited I’ll get to look back on this spread from my album and remember 2014’s spring & summer garden so vividly. Photos taken with an LG G2 and Nikon D700. Seed packets from my garden this year.